Families First - The Zeist Foundation, Inc. 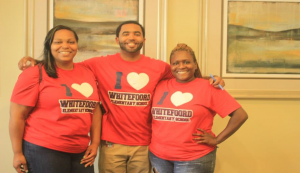 In 1995, after the Foundation made its first investment in the Edgewood neighborhood with the school based clinic at Whitefoord Elementary, it consulted with Families First to develop a community based organization that could serve children, youth and families and the Whitefoord Community Program was born. Over the next two decades, Families First grew as an organization and it now serves over 37,000 children, women and families in metro Atlanta with a mission to ensure the success of children in jeopardy by empowering families.